At a time when everyone is flexing muscles to strengthen “bonds of democracy” (pun intended), I am intrigued by the sudden spate of cinematic creations that seem less as art but more as “cinema of politics”. While pliable media houses have long indulged in abuse rather than analysis of issues, film producers (read businessmen) too seem to have joined the bandwagon of obfuscating real topics of “roti, kapda, makaan and naukri” to serve the political masters. Else, what explains the barrage of biographical films of political leaders and the sudden rise in movies that pedal ideologies aligned to ruling dispensation? Filmmakers may deny political motives but their manufacturing of larger than life images of political favourites does give rise to suspicion of hidden agendas to influence voters! Unlike today's unabashed “cinema of politics”, we have had political films in the past that seriously questioned socio-economic and political ethics of the nation. 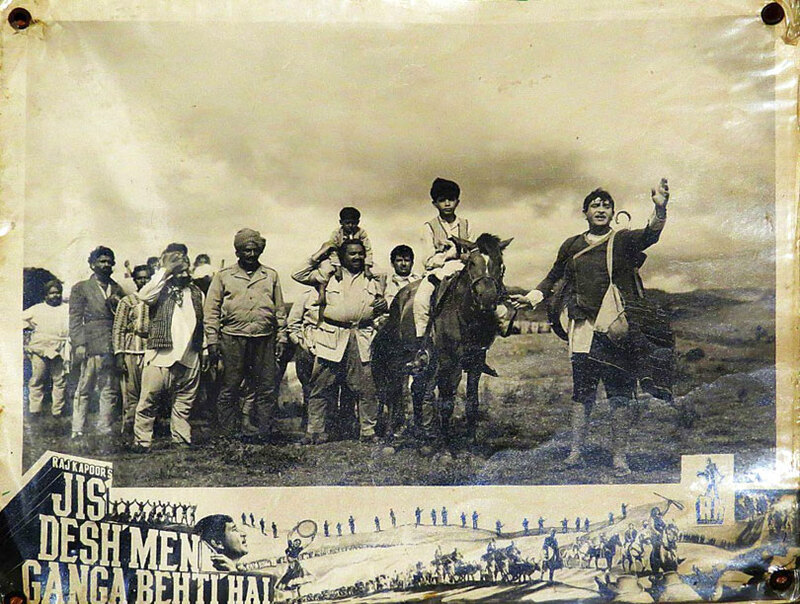 Films like “Jis Desh Mein Ganga Behti Hai”, “Mother India”, “Paigham”, “Boot Polish”, “Ganga Jamuna”, “Mujhe Jeene Do”, “Aakrosh”, “Manthan” and “Mrigya” were laced with stinging rebukes about India’s progress. In fact, the soul stirring lyrics of Hindi films ridiculed the actions and achievements of political leadership on several occasions and who can ever forget Rafi Sahab’s immortal soliloquy “Jinhein Hind Par Naaz Hai Wo Kahaan Hain (Where are those that are proud of India)” from “Pyaasa” or Saahir Ludhianvi’s other equally gut wrenching song “Chino-Arab Hamara, Hindustan Hamara, Rahne Ko Ghar Naheen Hai, Sara Jahan Hamara” (Though China, Arabia, India and the whole world is ours, Yet we have no place as home)” from “Phir Subah Hogi” that satirised feeble eradication of social and economic ills. 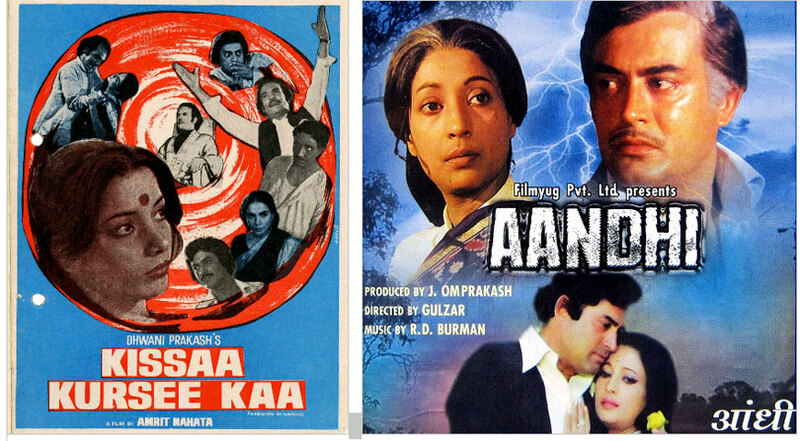 Films like “Kissa Kursi Ka” and “Aandhi” too have been touted as political films but while the first was a pathetic execution of a brilliant idea, the second was just a benign look at the life of a married female politician. Though both films allegedly targeted Indira Gandhi, the fact is that while “Kissa Kursi Ka” was certainly made by Amritlal Nahata at the instructions of Ms Gandhi’s detractors, Gulzar’s “Aandhi” had nothing in common with Ms Gandhi except a white streak in Suchitra Sen’s hairdo! However, the present unleashing of the “cinema of politics” just before 2019 general elections pleads for a serious introspection about motives and objectives of these biopic films. The highly publicised exhibition of “An Accidental Prime Minister”, “Thackeray”, “NTR” and now “PM Narendra Modi” may be described as mere coincidences in an election year but the powerful support to these films by politicians raises concerns of a surreptitious intent. 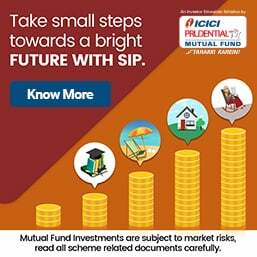 Though there are no visible proofs of financial collaborations by politicians or political parties in these projects, yet the manner in which Bharatiya Janata Party (BJP) leaders have taken part in promotion of “An Accidental Prime Minister” or “PM Narendra Modi” does make you doubt their assertions. It is pertinent to note that Vijay Gutte, the director of “An Accidental Prime Minister”, is the son of sugar baron Ratnakar Gutte, who had contested the 2014 Maharashtra Assembly elections as a BJP-alliance candidate! Similarly, The Wire has reported that “there is a lot more to (film) PM Narendra Modi than meets the eye”. Of course, films on lives of political personalities must be made but when some politicians are depicted as haloed figures while their opponents are caricatured as nincompoops, it clearly is not cinematic art but furtive misinformation at work. American academic philosopher John Dewey had stated “politics is the shadow cast on society by big business”. That is why one needs to reflect as to why Indian democracy has had such a surfeit of biopics on politicians in this election season? 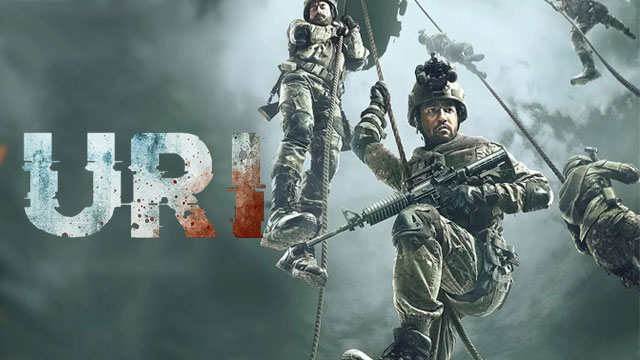 Not just that, how come in the last one year, film screens have been inundated by a string of films like “Padman”, “Gold”, “Satyamev Jayte”, “Parmanu: The Story of “Pokhran” and “Uri: The Surgical Strike” that package strident nationalism in a deft advertorial manner? Is it merely a twist of fate that shrill, innuendo laced trailers of a film on late Lal Bahadur Shastri are now appearing in a Goebbels like manner in media? Millions of innocent citizens from US to Russia to India are unaware of how their voting decisions are deftly manipulated by corporate businesses but social analysts know how money, muscle and propaganda are now used in tilting political elections around the world. It may not be wrong to assume that apart from bypassing the Election Code of Conduct as well as expenditure limits laid down by the Election Commission; “cinema of politics” is a new tool in India for political canvassing because as Harry Truman so eloquently defined: “if you can’t convince them, confuse them”. Like the electoral bonds, which have been stated as grave risk for democracy by the election commission, propaganda films too are prejudicial to public interest as they are heavily biased in favour of the government of the day. Remember, lies travel faster and surer than truth and the damage can never be undone! 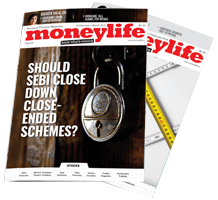 Author’s Note: It is an honour to be invited to write a regular column for “Moneylife”; an institution I have admired for its relentless quest for truth, transparency and rule of law. Resultant of long sessions of introspections, my writings yearn to make this world a better place than ever before by building bridges of understanding. Hence, I look to forge a strong relationship with the enlightened readers of “Moneylife” as their acceptance alone adds to the respect, credibility, stature and confidence of a writer. (Deepak Mahaan is a well-known Documentary Film Maker, Writer and Commentator). Many of the producers of these films work in cahoot with the political parties.Lampooning other politicians and prime ministers who have made a significant impact in nation building shows their poor taste.The only objective appears to be make a quick buck. Indeed a good piece of writing with well crafted language. Anytime I can use it in my session for expression. Very well written. Look forward to more. I feel films based on political personalities have an agenda. But when it comes to padman, Kaari, etc - I think they are driven by commercial consideration. The atmosphere / mood in country gives an incentive to make such movies. But to say, the primary force is political consideration - I don't think so. No producer - and certainly not Akshay Kumar - will let it be the main driver. Why do you think Akshay Kumar is so clean? After a day spent trekking in and around the cenotaphs, floating on the river in a paddle boat with wife and boatman, we walked across to the main Ram Rajya temple and then walked back to our hotel as the sounds of the evening aarti receded in the background. 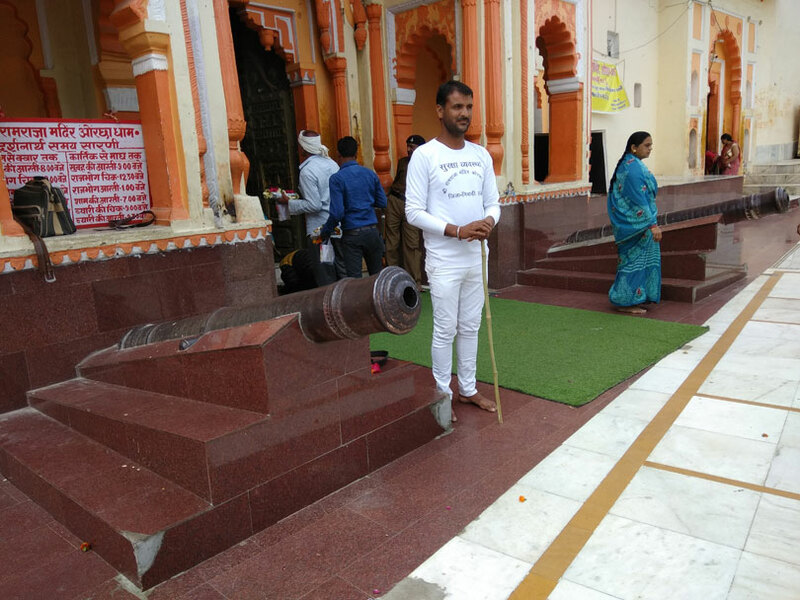 This temple is a new construction, has a pair of ancient cannons at its entry gate, is blessed with a gun salute provided by the Uttar Pradesh police during the day and the evening aarti is certainly vibrant - and has big NO PHOTOGRAPHY signs all over. I had to use all my charm to be permitted to take that one photograph you see with the cannon, the temple guard, and the main entry to the Ram Rajya Temple. The cenotaphs, a full day’s engagement as I mentioned, look much better at sunset. The official closing time is 5pm. Motivation works if you want to meander around as the shadows lengthen. Plus the ghat near the river becomes interesting - local musicians often gather there for impromptu concerts, or on demand. Ask around. There is great mystery unfolding here when the sun sets. 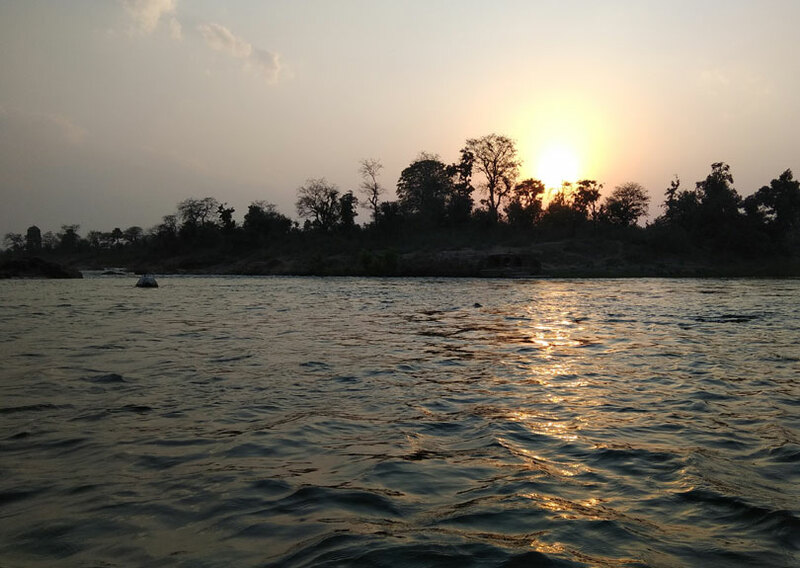 Next morning, after a filter coffee by the river and breakfast, we checked out of the Riverside Bundelkhand, and decided to spend the rest of the day in Jhansi. In our original plans we had allowed a full day there, before catching the Shatabdi back. Big mistakes, plural. The famous Jhansi Fort, maintained by ASI and Central government, is full of surly employees and security guards with nothing better to do than to try and force me to admit that I was a foreigner. Brightly coloured socks again. A documentary show which is part of the ticket price, I am informed by another surly gentleman, is available on YouTube. Allow 30 minutes here for a badly maintained property, which could and should otherwise have a more prideful place in our history as the Red Fort. Next on the agenda is the Jhansi Museum. This one put me off right away. Big banners celebrating Jhansi ki Rani, fair enough, but do they have to mention "Mutiny of 1857" all over the place too? "First Battle of Independence" is what it is. Operated by the State government, this one is dusty, and kind of haphazard. Also, the ladies toilet was locked, and nobody knew who had the key because "Madam was absent". Suggestion offered was that a security guard would stand outside the gentlemen’s toilet if ladies wanted to use the facility. And finally, the Shatabdi from Bhopal towards New Delhi via Jhansi is not at all anywhere close to the Gatimaan Express in all respects - and we opted for the later Shatabdi because we assumed that Jhansi was worth a full day. Which is a pity, because the Fort could do with much better signage explaining things, and the Museum likewise. The First War of Independence, for example, has never been explained to us properly in our history and perception management - which is, that it was a pan-India movement, and involved heavy co-ordination as well as logistics to push the British from all over to take refuge across the Ganga towards Roorkee and Dehradun and Delhi. Instead, both the Fort and the Museum in Jhansi tend to glorify the British, which might have been acceptable at one time, but now, in 2019? With nothing else to do in Jhansi, we grabbed a bite at a surprisingly pleasant "Bakers Factory" in Jhansi, good satisfying cannelloni and packed a pizza as back-up for the Shatabdi ride ahead. And with 3 hours still to kill, decided to check out the "Herbal Garden", which even our otherwise well informed driver did not know about. In Jhansi Cantonment, it will come up on your map, otherwise ask any of the many military people around. This was the high point of our trip to Jhansi and we shall recommend it to everybody headed that way. The back story here is that this was a 50 acre or so patch of cantonment board land being eyed by the land-grabber lobby, so it was rapidly developed by the resident military formations into a huge bio-diversity park with sculptures made from military scrap. The horticulturists there are keen to explain things in the precise military way, the bio-toilet in the park is clean and unlocked, the signage and stories are well laid out, and most of all - the place is safe from leering security. Sure, there are eyes over the whole park, but they are not intrusive. Open to all, free, and a big salute to the people who thought it up and then made it happen. We then headed for Jhansi railway station and all the scams that it provides us with, including the parking lot. It’s not much better on the platform, we have seen much cleaner ones. The executive lounge for passengers travelling in executive class or 1AC has become an enclosure for VIPs only. The waiting room is filthy. The platform for our train is announced 6 minutes before arrival, which leaves many, especially foreign tourists, running around in panic. And finally, as the Bhopal Shatabdi wheezes in, the thousands of birds above the uncovered platform decide it is time for their evening rituals, so some passengers get blessed with bird droppings as a parting gift. 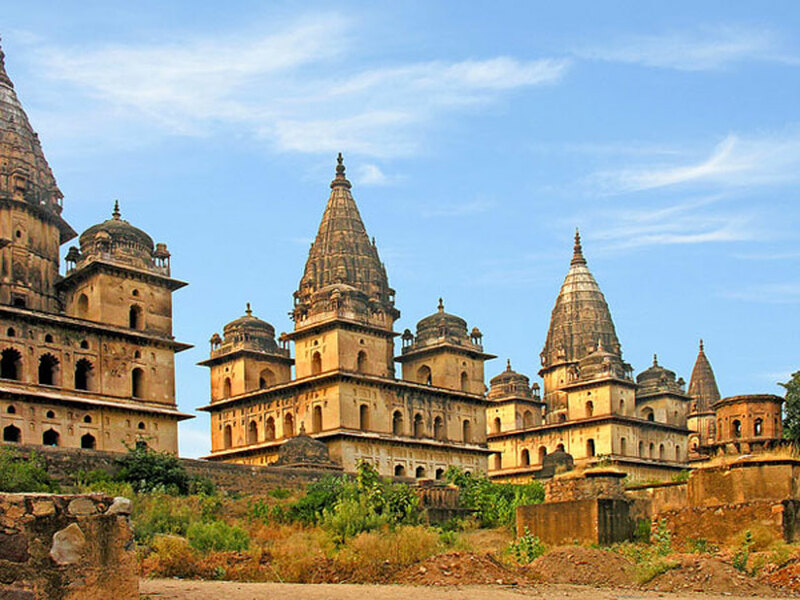 Overall, Orchha is certainly a must-do if your interests extend to trying to decipher old temples as providers of open source technology, and also as an example of the genuine honesty and innocence that comes out of Bundelkhand. Unlike in many other tourist towns in India, for example, all the shops were operated by local people including women. They are honest, and that means a lot if you go with family. Jhansi, on the other hand, is like my report card from school - "can do better if tries". Jhansi is more generous towards the British probably coz of the big cantonment crowd present there....also the fort is not as well maintained since the yadavs are busy grabbing land and the mayawati are busy building their.own statues. Who cares for history? Things would have been totally different if jhansi was in MP. Sheer badluck. Why would the govts. in UP care for Bundelkhand(the U.P. part) when it merely offers 20-30 seats in a 400+ assembly. 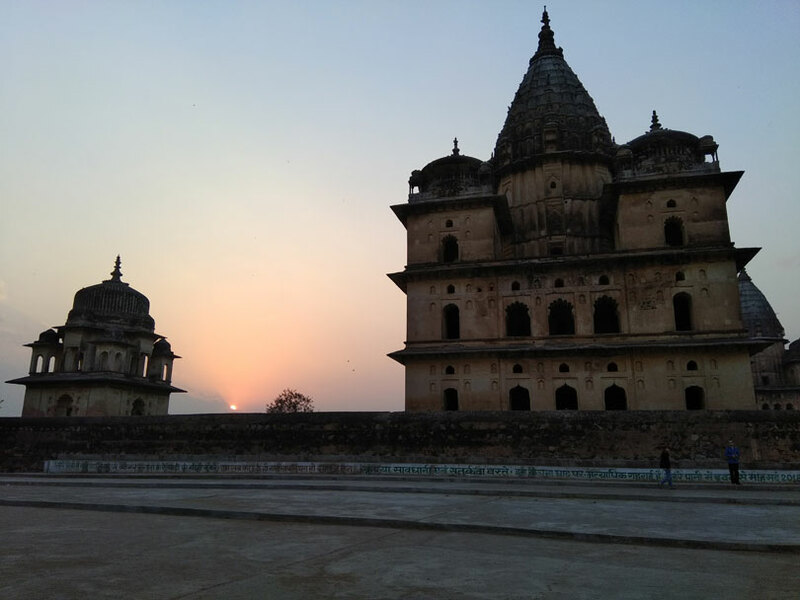 It was at about this time in the course of our trip to Orchha that I started feeling stupid for not having carried the better cameras available to me, kind courtesy grown up children who keep their father in good humour by giving him new electronic toys every now and then. Smartphone cameras have made us lazy: even though they are great for taking quick photographs of each other, for quality pictures they fall short and your writer is going to start carrying proper cameras henceforth. A German tourist from Dresden explained to me, "To do justice to what we are seeing in front of us, we must use a better camera." I promised him I would abide by his advice, because, our visit the next day to the cenotaphs, locally known as chattries, was, even to my well-travelled eyes and inner senses, amazing. So much so that we went again in the evening, to try and make sense of the shadows in the two hours before sunset, as well as get a more neutral light to really get a better grip on the whole architecture and precision laid out in front of us in a garden that was the cleanest piece of real estate for miles around. 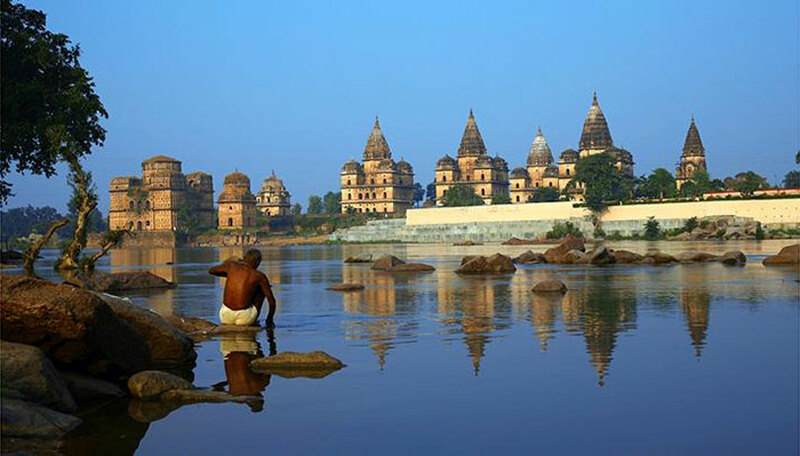 The cenotaphs at Orchha are about 1km upstream of the fort and temple, on the Betwa river as it flows in a north-easterly direction, on its way from Hoshangabad towards the Yamuna. The gradient, cleanliness and speed of the river here is quite impressive, and white water rafting over some challenging rock faces as well as paddle boats for tourists in the easier parts, are available. 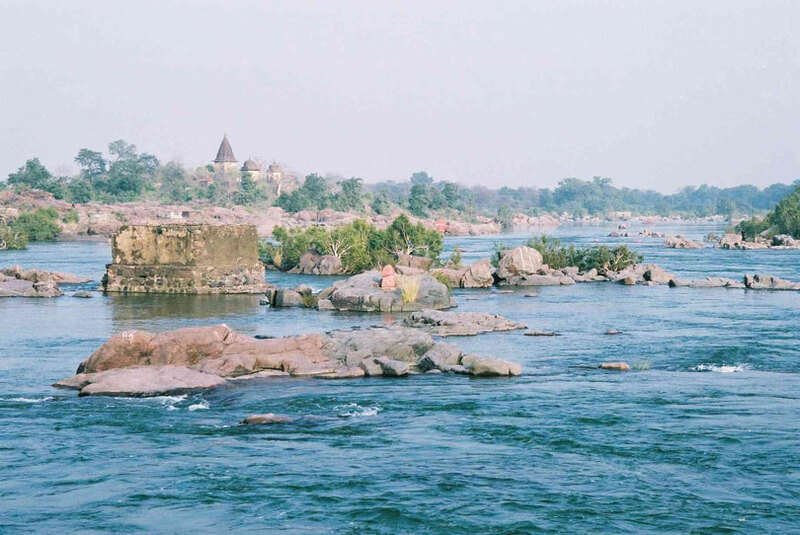 On its own, a visit to Orchha to see the Betwa river itself is worth the effort, with many of the hotels being built on and along the banks of this historic river. 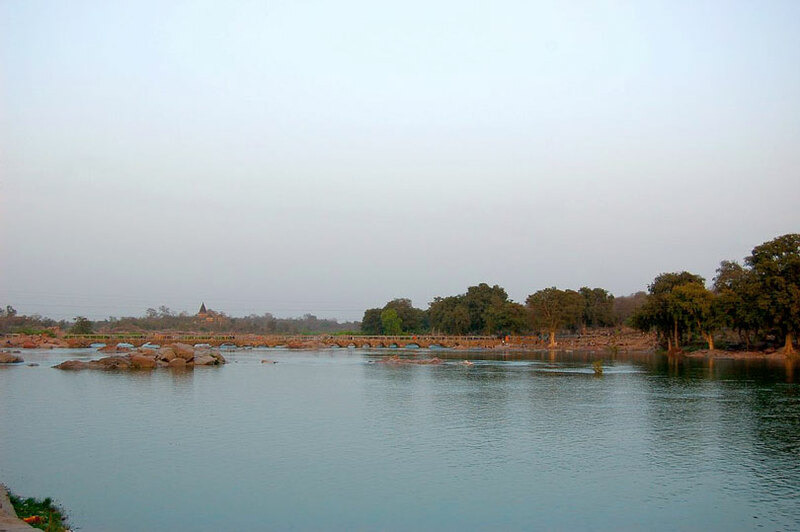 There are also a large number and variety of migratory birds returning to this part of the whole Chambal - Betwa - Yamuna wetlands, largely due to more awareness on the part of the people who live there, and good work done by the governments of Uttar Pradesh and Madhya Pradesh in this context. We did not see any plastic waste floating past us in the river throughout our visit. Do you know how amazing this is? The water is clean enough to drink straight from the river or the many streams emerging from the small hills in the area. The moat around the fort is green with scum and is a breeding ground for flies and mosquitoes right next to the municipality offices there. And only crows inhabit the area. The good bird watching spots are away from the government offices and fort area, both sides of the town. I am not an expert in bird watching but if the number of serious looking tourists with huge camera sets is an indication, it should be serious business here. The riverbank is people by fine, enthusiastic young boat operators, well-trained in life-saving by the navy, who displayed their certification with pride. Enquiry revealed that they had obtained it from Goa. There are no motor boats here, no casting off if you don't wear your life-jackets, no human entry into the swampy areas, and absolutely no boating after sunset, at any cost, as it is not good for the environment. Back then, to the cenotaphs. There are 14 of them grouped together at one location, built from the 16th to the 18th century, as memorials to the Bundela rulers there. These 14 are very well maintained, probably counting amongst the cleanest monuments seen in a while, and each one has some design brilliance which requires much more than a rapid spin around. There is a very interesting square-circle design element which needs to be seen to be understood better. There are also a large number of similar cenotaphs scattered around in the forests nearby, many abandoned, waiting to be discovered. 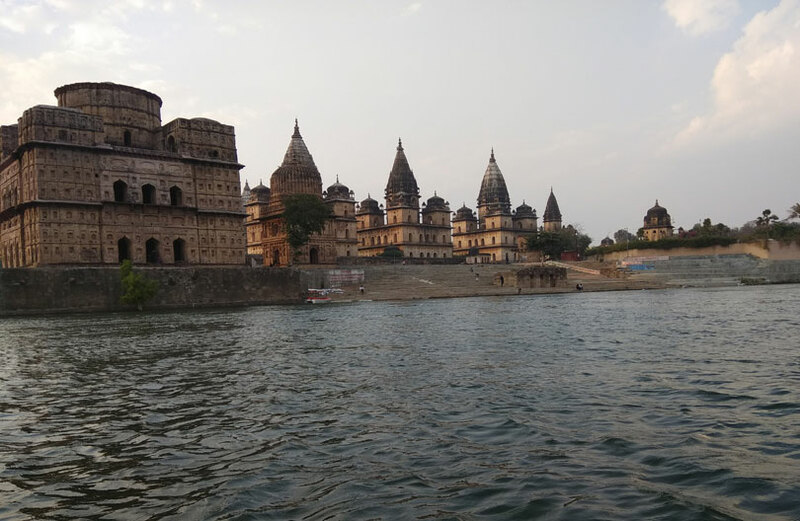 The vulture population, seven species according to the local people (four according to some reports) is being consciously conserved and nurtured through local participation in Orchha. 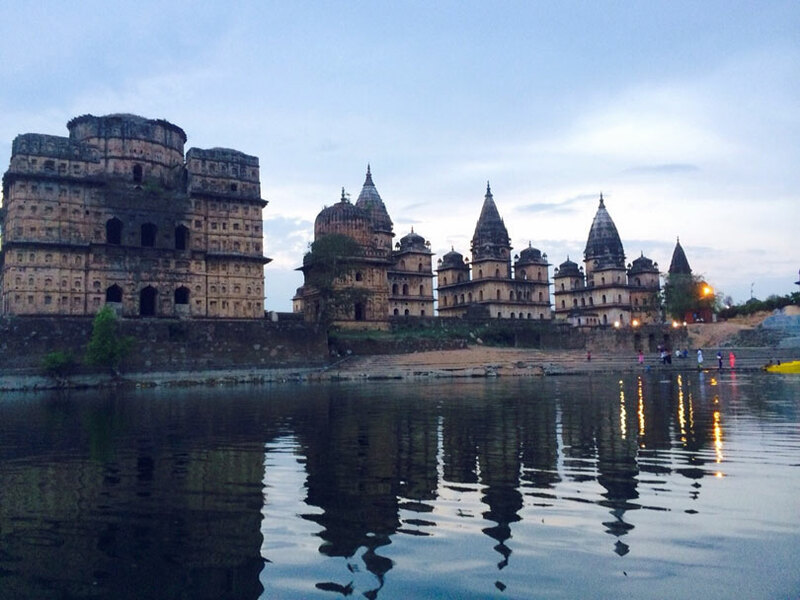 Local people are very well aware that this will improve Orchha’s tourism potential, so the vultures are not disturbed, hunted or given access to the dead carcasses of buffaloes which caused their almost total extinction in other parts of India. We spent a lot of time at the cenotaphs, and would recommend a full day there, with time off for lunch. Do remember to wear a hat, though, and pack strong trekking shoes, preferably hard soled. Once again, research on the cenotaphs provides more mythology than details, but the alignments and construction suggest adherence to astronomical and cosmic patterns, which will need much more research than what I am capable of. Really nice one. But it will be wonderful if there is a route map to access the spot from far off places.